As you begin your investing journey, you are going to come across many admonishments to avoid market timing; entreaties warning you about its dangers, tax inefficiencies, and potentially severe risks. Pay attention to these well if you want to build wealth and avoid catastrophic wipeout or permanent capital impairment. To help you do just that, I want to take some time to discuss market timing so you better understand it, know how to recognize market timing when you see it (even if it is in your own behavior), and how to differentiate it from other, more intelligent strategies. To discover the answer, you need to understand that in almost all cases, there are really only three underlying methodologies a person or institution can use to acquire any asset, be it stocks, bonds, mutual funds, real estate, private businesses, or intellectual property. Let's expand upon them here. Valuation: When a valuation approach is used, a person examines the net present value of the discounted cash flows, among other techniques, to arrive at what is known as "intrinsic value". It answers the question, "If I owned this asset 'from now until doomsday', as one famous investor quips, and wanted to earn a rate of return of [x]% per annum, how much would I have to pay to enjoy a high probability of generating my required rate of return?" It can take a decade of accounting, finance, and practical, applied experience to be able to fully take advantage of this approach because it requires knowing how the pieces fit together and treating securities such as stocks as if they were private enterprises; e.g., whether net earnings are "high quality" or suffer from a disproportionate degree of accruals indicating the cash flow isn't as real, or unrestricted, as one might hope. No matter what fads or fashions come and go, ultimately, reality wins and valuation, like gravity, exerts its influence. Valuation is precisely that: The reality upon which everything else relies no matter how much people or institutions want to ignore it. It always wins in the end. Formula or Systematic Acquisitions: When people don't know how to take advantage of valuation, or they have no interest in the time it requires to do it, they may engage in what is known as a formula or systematic approach to portfolio construction. Basically, a certain amount of money or a set percentage of cash flow is used to regularly acquire assets regardless of market or asset level, hoping that the highs and lows will balance each other out over the decades. Techniques such as dollar cost averaging or funding a 401(k) through payroll deductions are real-world examples. Taking advantage of direct stock purchase plans and dividend reinvestment plans is another example; regularly having money taking out of your checking or savings account to acquire ownership in businesses that you want to hold for the long-term. Market Timing: With market timing, the portfolio manager or investor is speculating that the price, rather than value (the two can diverge temporarily, sometimes for extended periods of time that last for years), will increase or decrease. He or she then attempts to make a profit by predicting what other people will do rather than based on the underlying cash flows and other relevant variables you see in the valuation approach. 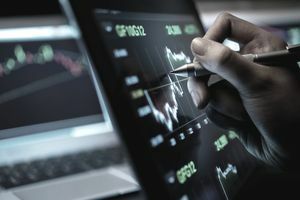 Market timing can often be coupled with leverage, either in the form of borrowed money such as margin debt or stock options, such as the buy side of calls. The primary appeal of market timing is that despite the near impossibility of doing it regularly with any degree of success, one or two correct calls, coupled with enough risk, can mean getting rich overnight rather than achieving financial independence over many decades as the other two approaches may require. Yielding to that siren call has resulted in countless hopes and dreams being dashed upon the rocks of error, speculation, and impatience. To understand the difference between valuation, formula or systematic acquisitions, and market timing, let's go back in time to a great historical case study: The 1990's stock market boom. By the time March of 2000 had rolled around, equity valuations had become truly insane in parts of the market. The earnings yield on enormous blue-chip stocks such as Wal-Mart, which had little chance to grow at historical rates due to sheer size, was a paltry 2.54% compared to the 5.49% you could get holding long-term Treasury bonds. Stated another way, the market efficiency had completely broken down to the point you could get nearly double the return by parking your money in the safest asset in the world rather than owning the country's largest retailer. How would different types of investors approach this sort of thing? Valuation-Driven Investors reallocated a significant portion of their portfolio from equities to other assets, unwilling to deal with the insanity any longer. John Bogle, the Princeton-educated economist who founded Vanguard and made the index fund a household concept after he launched the first S&P 500 fund back in the 1970s, famously liquidated a vast majority of his personal stock holdings and moved it into bonds, where yields were far more attractive as he could no longer justify the valuation levels of stocks. Warren Buffett had his holding company, Berkshire Hathaway, merge with a giant insurance conglomerate known as General Re which had the effect of radically altering the ratio of stocks-to-bonds in the firm's portfolio in favor of fixed income securities while allowing him to retain the deferred tax liabilities on his appreciated stakes of Coca-Cola, Gillette, and The Washington Post. Dr. Jeremy Siegel at Wharton Business School penned op-eds in major newspapers warning that valuation levels had become completely unhinged from reality; that it was a mathematical certainty businesses could not be worth the prices investors were paying based on any reasonable corporate earnings projection. Formula or Systematic Investors continued what they were doing, paying ridiculous prices for assets that, from the time of purchase, took more than a decade to burn off their overvaluation but that actually recovered much faster due to the substantial drop in stock prices that occurred between 2000 and 2002 when the wheels came off the Internet bubble. This had the effect of largely averaging out prices so that the overall experience was still somewhat satisfactory. Market Timers placed bets in any and all directions based on their personal hypothesis about what was going to happen. Some went bankrupt as investors realized there was no valuation foundation upon which the equities they had acquired could rest, resulting in declines of 90%, 95%, and in some cases 100% before tax loss offsets. Some got rich, shorting the whole mess by accurately predicting the timing of the collapse. Some broke even. A lot of the institutional asset management companies and funds that specialized in trading shares of the technology giants either were merged into non-existence or went out of business after investors abandoned them following horrific life-altering losses. Formula or systematic investors who aren't experienced and don't understand more than the rudimentary basics of portfolio management frequently seem to confuse valuation-driven approaches with market timing even though there is almost nothing in common between the two. The moment you say, "I'm going to buy ownership in [insert asset here] because I think it is cheap relative to the intrinsic value and plan on holding it for the next few decades as part of a diversified portfolio", they scream, "Market timing!". Stop listening because whatever comes out of their mouth from that point on is likely nonsense. A real-world illustration might help. John Bogle at Vanguard wasn't engaging in market timing when he looked at the returns on stocks versus the returns on bonds during the dot-com bubble and decided that investors were faced with a once-in-a-lifetime mispricing event. He wasn't being irrational or speculating when he took his bond component down to 25% or less, as he told one Morningstar conference at the time. He had no opinion about whether stocks would be up or down a month, or even a year, from the time he made the comment and switched his personal asset class exposure. He simply knew that the then-valuation levels were not sustainable and represented a reckless abandonment of sane behavior. There was no underlying meat (earnings and assets) for much of the stock market sizzle (stock price). The best way to differentiate between a valuation approach and a market timing approach is to ask: "Why is this being done?" If the answer is because an asset is or isn't attractive relative to its cash flows and assets, it's valuation. If it's because there is a fear or hope that the asset will increase/decrease in price for any other reason -- macroeconomic, political, emotional -- it's market timing.